Throughout the 1980s and 1990s, the Toyota Camry built a reputation among automotive experts and consumers alike for its outstanding durability, high level of fit and finish, excellent fuel efficiency, and comfortable ride quality. As a result, the Camry became a perennial best-seller. However, as it entered the 2000s, Toyota began to get too comfortable, as quality began to dip while other midsize sedan began to overtake it in certain aspects. Thankfully, the Camry began to regain its luster of yesteryear, as Toyota, in addition to restoring the nameplate’s penchant for durability and build quality, also addressed the few enduring weaknesses that it had. 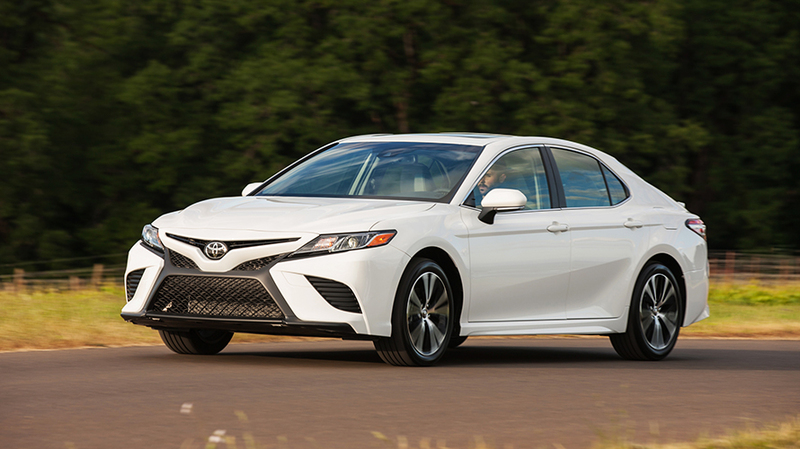 Unlike the models of the past, the Toyota Camry is now quite an attractive vehicle to look at. And with the 2018 model year kicking off its eighth production cycle, the Camry is back to being the #1 mid-size sedan, according to U.S. News & World Report based on the publication’s comprehensive evaluation of professional industry reviews and rankings. What’s new for the Camry is the Toyota New Global Architecture platform, which is the combination of components that the Toyota Prius hybrid hatchback and the all-new C-HR crossover use. Consequently, the Camry, for the first time in its history, relies on front fascias to differentiate the trims, which are the L, LE, SE, XLE, and XSE. With flowing rooflines, thin and visually sharp exterior lights, and expansive air vents, the 2018 Camry looks better than previous models. Powering the 2018 Toyota Camry are one of two engines, which make their appearances for the first time. There’s the A25A-FKS, a 2.5-liter inline 4-cylinder engine that produces 203 horsepower and 184 lb-ft of torque. And there’s the 2GR-FKS, a 3.5-liter V6, which produces 301 horsepower and 267 lb-ft of torque. Each engine is paired with the brand-new 8-speed direct-shift automatic transmission. Gas mileage on the Camry is measured at up to 29 mpg in the city and 41 mpg on the highway, depending on trim and powertrain configuration. A five-seater, the 2018 Camry provides up to 100.4 cubic feet in passenger volume, plus up to 15.1 cubic feet of trunk space. Eight-way power adjustability with power lumbar support is added once you upgrade to the LE. If you go with the luxury-oriented XLE or XSE, Toyota adds 8-way power on the front passenger seat, and the seats are covered in leather. The sport-oriented SE is the only one with vinyl seats. The 2018 Camry marks the debut of Toyota’s latest version of its Entune multimedia system. Dubbed “Entune 3.0,” the system includes six-speaker audio, Bluetooth connectivity, and a 7-inch touchscreen. Other standard features include an integrated backup camera and a 4.2-inch TFT multi-information display. The XSE gets a few more additions or enhancements, such as dual-zone automatic climate control, a larger (7-inch) TFT multi-information display, and a smart key system with push-button engine start. The V6-equipped models stand out with features such as nine-speaker audio, an 8-inch touchscreen, a free three-month SiriusXM satellite radio subscription, a 10-inch head-up display, a panoramic tilt-and-slide moonroof, and the brand-new Dynamic Navigation system. For restraint and cushioning in the event of a collision, the 2018 Toyota Camry comes with 10 airbags. Also standard are two safety bundles that are referred to as Toyota Safety Sense P and Star Safety System. Safety Sense P includes automatic high beams, dynamic radar cruise control, a pre-collision system with pedestrian detection, and lane departure alert with steering assist. And Star Safety consists of electronic vehicle stability control, traction control, smart stop technology, and an anti-lock braking system with electronic brake-force distribution and brake assist. An anti-theft system is added on the LE and higher, and a blind spot monitor system with rear cross-traffic alert appears on the XLE and XSE. The starting manufacturer’s suggested retail price range is $23,495 to $34,950. For more specs, go to Toyota.com.